I was pleasantly surprised when I was checking my personal emails one evening to receive an invitation from Jasmine to attend a Food Bloggers tea-party. I did not know who Jasmine was but did know a couple of bloggers on the invitation list, namely Edith and Zhuoyuan . The tea-party would be hosted at Edith's house. This would not be the first time Edith would be hosting a food bloggers gathering. A year and half ago, she had hosted our first gathering and it was a tremendous success. Again Edith has so kindly opened her beautiful home to all of us. As usual whenever food bloggers get together there would be a huge assortment of treats. This time round was no exception and the menu consisted mainly of desserts with a couple of savoury items thrown in. 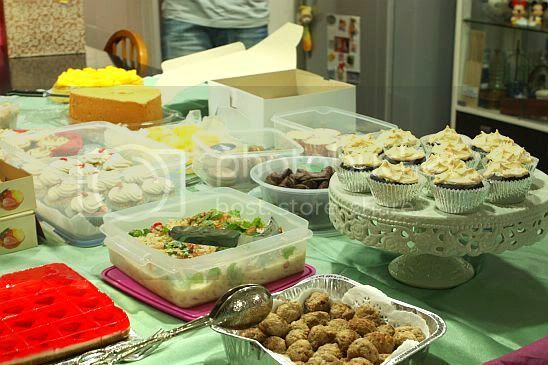 Almost everyone brought two types of desserts and we ended up with a huge feast. 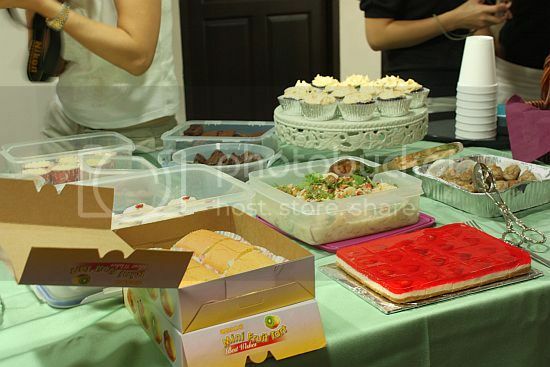 We had cupcakes, brownies, lemon bars, durian swiss roll, durian chiffon cake, cheesecakes, meat balls, macarons and more. Check out the below blogs of my "old" and new blogger friends, each and every one so very talented as well. I decided to bring something savoury instead. And as I didn't have much time over the week, I made a Thai pomelo salad instead. 1) Peel pomelo and shread the flesh. Leave as chunky pieces. 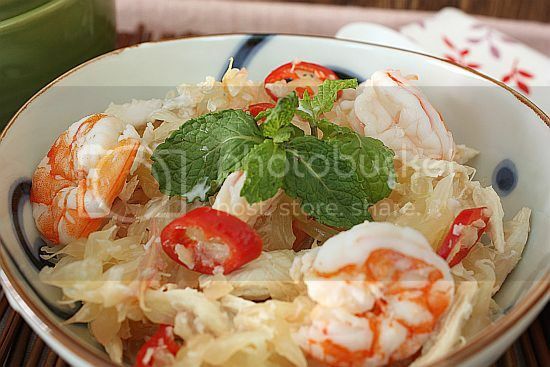 2) Place lime juice, fish sauce and sugar in a bowl and stir to mix until sugar has dissolved. 3) Then add in the prawns, chicken, dessicated coconut and coconut cream. Toss to coat the pomelo. Add in the mint leaves and transfer to serving platter. 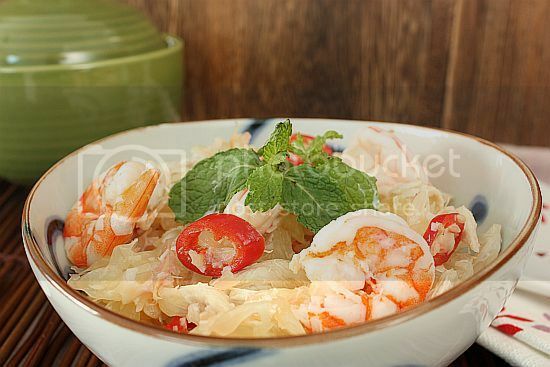 Sprinkle the top with dried shrimp and toasted sesame seeds and a few mint leaves. 4) Serve immediately as this salad does not keep over night. Food bloggers gatherings are fun, always so much yummy food! This sounds like fun and the food looks great too!! Jo, glad that you all had a great time! The only thing that worries me when it comes to all these is whether we wind up having too much of a sugar rush ... LOL! It's always desserts! Nice meeting you again! Enjoyed your salad too! Lucky hubby who gets to savour this. he liked it! I missed this one. 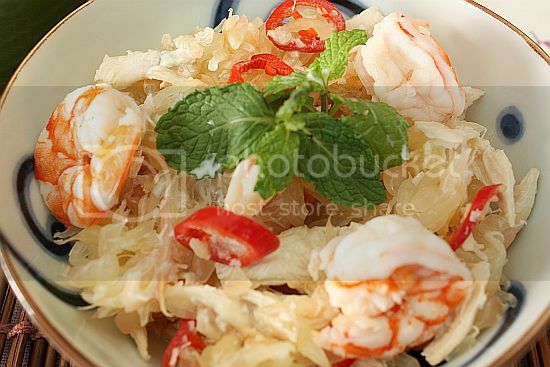 The Pomelo salad is my favourite Thai salad. what a nice salad to spice things up at a gathering. What a fun gathering and it's full of delicious food! What a lovely selection of goodies, it looks like a fund time was had by all.